My server is fakakta. It happens way too often, usually hitting refresh will get them to post. 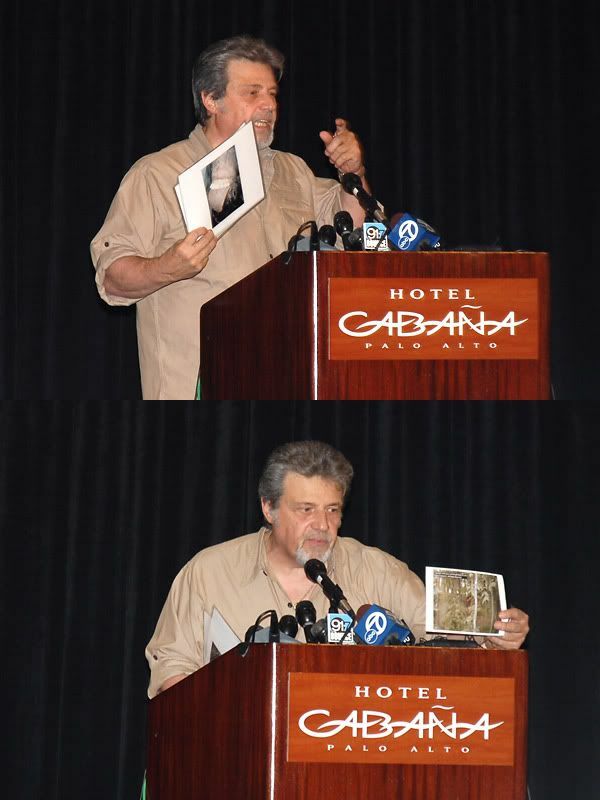 OK, here's the complete report on the Bigfoot Press Conference. This guy was out on the street holding a sign that said "Honk 4 Bigfoot" and "Palo Alto Loves Bigfoot." He was a friendly guy but a little strange. He was carrying two scanners and a slick Yaesu "ham" radio that mounted to his handlebars. The lady on the left was a serious Bigfoot conspiracy theorist. She felt that the media was suppressing the evidence and was asking the guy if he seriously believed in Bigfoot. So the local NBC, ABC, and CBS affiliates all showed up. I saw the local Fox affiliate inside as well. I didn't get in until about 30 minutes into the press conference, and people were asking serious questions like they actually had a body and actually spotted a living bigfoot. Five minutes later someone asked "Is this a hoax?" I can't believe it took 35 minutes before someone asked that question. There was no shortage of cameras and serious news people there. I asked a guy with an ABC News credential: "Why are you guys taking this seriously?" He had this complex look that said "My journalistic integrity makes me appalled," but then he grumbled half-heartedly "Well, it's entertaining." This is Tom Biscardi producing two additional images documenting his "proof." I think all three guys took questions. Descriptions are further below. At the end he said he would pass out copies of the two additional photographs. There was a crush of people trying to get the pics. Biscardi was making people show their credentials so I couldn't get them. After the press conference, Bigfoot got on his knees while someone interviewed him on camera, and the question I heard was: "What's on your iPod?" Don't be sorry.. Hee hee hee.. LOL And I thought I fixed it I just reposted it and it fixed itself because it was refreshed! LOL.. I forgot about your server.. I remember you told us that before... sorry a brain Fart at my age is not so uncommon! I'm not too far behind you myself, and my brain has been windy for some time now. They outed themselves as a hoax today. At this time action is being instigated against the perpetrators of this fraud," Kulls writes on Biscardi's Web site. "On behalf of myself I can say with certainty Matthew Whitton and Ricky Dyer [are] not the best Bigfoot trackers in the world! The two hoaxers being interviewed by our local TV. "I don't believe it does effect my credibility at all, because this is Bigfoot." Glad to hear I am not alone in this! LOL..
Thats funny!!!! Perhaps people had hoped it was real.. LOL..
Re: "They" found a bigfoot corpse. Page created in 0.16 seconds with 56 queries.